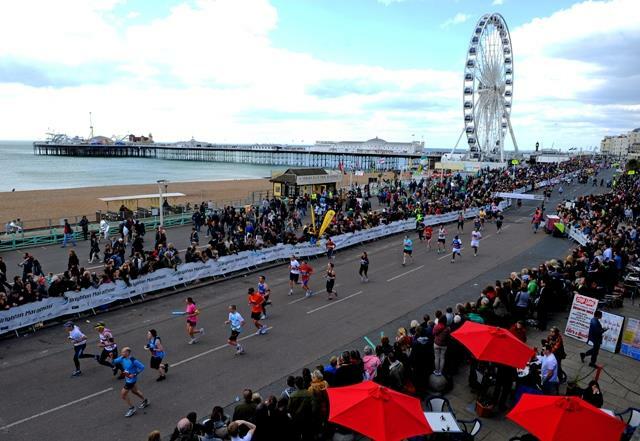 Dominic Kangor was the surprise winner of the fourth edition of the Brighton Marathon, winning the race ahead of a clutch of strong Kenyans, five of whom had better times coming into the race. Kangor won in 2 hours 10 minutes and 46 seconds, a 2 minute 29 second improvement on his previous best set, and a course record in Brighton by 77 seconds. Brighton represented Murgor’s first race in Europe and his win here now gives him a four-out-of-five winning record from his five marathons since 2011. Previously, he had won the Mwea Classic Marathon in Kenya in 2011 and 2012 and the MTN Kampala Marathon in 2012, as well as finishing 3rd in the Kericho Marathon. But he had to work hard for his victory. The leading group of 9 runners went through halfway in 1:05:08 and 15M in 1:14:23, led by pacemakers John Kales and Andrew Lesuuda. Kales stepped off the road shortly afterwards, and Lesuuda continued to lead the pack back onto the seafront road, passing 30km in 1:32:23 and 20 miles in 1:39:11. As the pacemaker pulled up at 21M, a group of 3 Kenyans (Kangor, Bernard Rotich and Elijah Tirop) were together, with Murgor about 50m adrift in 4th , Mwangi in 5th and Chebet (the fastest runner in the field with a PB of 2:09:26) starting to fall back. After the turn at 21.5M at Shoreham Port, the race broke up further as Kangor injected pace to take Rotich with him, heading back into the strong breeze blowing off the sea and back towards the promenade run into the finish. 40km was passed in 2:03:19. With 800m to go Kangor started to pull away, and came into the finishing straight about 30m clear of Rotich, a lead he maintained down the finishing straight to become the 3rd Kenyan in 4 years to become the men’s Brighton marathon champion. Rotich was 2nd in 2:10:51, while Robert Mwangi finished strongly to claim 3rd place in 2:11:26. In the women’s race Eunice Kales executed a textbook performance to win her first marathon. Sitting back behind the two pacemakers for the first half, she went through halfway in 1:14:57, running alongside Aly Dixon and fellow Kenyan Frashiah Waithaka. Dixon had set herself a dream goal of 2 hours and 30 minutes and stayed on this pace through 15 miles. At this point Kales took up the lead, taking one of the pacemakers with her and started to open up a lead, which was 40m at 16M (1:30:37) and had extended to around 200m by 19M. Kales passed 20 miles in 1:52:22 with a one-minute lead. Kales slowed slightly over the race’s last 3 miles, but continued to extend her lead as Dixon fought hard on her own into the wind along the promenade between 23 and 25M. Kales passed 40km in 2:20:41 with Dixon through in 2:23:27. Despite the headwind in the race’s last 5 miles, Kales’ winning time of 2 hours 28 minutes and 50 seconds included a second-half split of 1:13:53, more than one minute faster than her first half. Further back Dixon dug deep in pursuit of the 2:31 qualifying mark set by UKA for the 2013 World Championship maratho_nSelection, in the end falling short by a mere 10 seconds. “I’m chuffed to bits with the time - 70 percent elated, but 30 percent gutted because of missing out on qualification” was her immediate post-race reflection on her result. Further back Frashiah Waithaka finished 3rd in 2:33:31, while Dorcus Inzikuru could only manage 2:42:38 for her debut marathon, thus failing in her bid to break the Ugandan women’s marathon record. The other main British interest in the race came from a personal best result of 2 hours 20 minutes and 30 seconds for Jon Pepper. Before the race Pepper had set himself the goal of a sub-2:16 time but said afterwards that he struggled to find any rhythm for the first 14 miles of the race (passing halfway in 1:08:29), and then finding himself on his own after his two pacemakers retired at 15M.